"Your New Home in the Sunshine State"
Size: 2,238 sq. ft. "more or less"
Vaulted ceilings. Spacious open floor plan. Your Florida lifestyle will be everything you dreamed in this 2005 Palm Harbour 2/2 manufactured home with 2,208 sq ft that offers the peaceful easy living you’d expect in SWFL. Newer appliances in kitchen (fridge is six months old) and front loading washer and dryer will remain with the home. Nice laminate flooring is new, new paint, new fixtures in guest bath, and a new hot water heater. Furniture and electronics can be negotiated. This community is 10 miles from the Gulf Coast and close to the best of what SWFL has to offer. This community offers organized activities, a spacious clubhouse, a well-equipped fitness center, and a community swimming pool. There is convenient access to on-site management. With the open floor plan, this home is perfect for entertaining friends and family or relaxing after a hard day living your Florida lifestyle at the Barbara B Mann Performing Arts Hall, the Edison-Ford Winter Estates, the Lee Civic Center, the Boston Red Sox and the Minnesota Twins spring training, Fort Myers Historical Museum, Lee County Arts Center, Miromar Outlets, Tanger Outlets, on the nearby beaches of Fort Myers Beach, Sanibel, and Captiva or in the beautiful, friendly gated Buccaneer Estates. Boat and RV storage is available in the community. 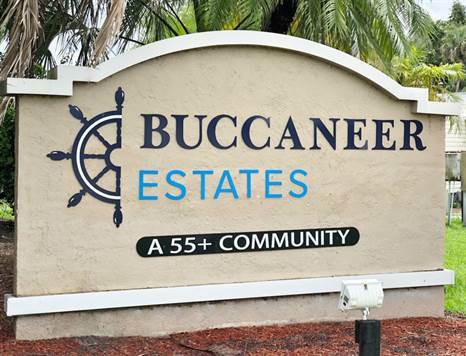 Buccaneer Estates is a 55 40+ Community. Buyer/s must be park approved.